Each year the Dutch Meteorological Society (NVBM) organises a site visit to institutes that are stakeholders of meteorological information and knowledge. 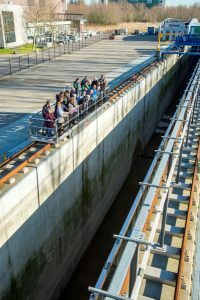 This year the NVBM visited Deltares and the faculty of Aerospace Engineering at Delft University of Technology, which are both located in Delft. Deltares is a research institute that focuses on hydrological and hydraulic environmental problems, e.g. coastal protection, flooding, droughts etc. The institute has 900 full-time employees and develops research software and scale models to study these environmental challenges. They are well known for their laboratory research facilities such as water flumes and water tanks, where they test to- scale dike designs and foundations for wind turbines for scour protection. Their largest facility is the so called Delta Flume, which is 300 m long, 9.5 m deep and has a width of 5 m. In the Delta Flume waves with heights of up to 4.5 m can be generated. This tank is used for testing coastal designs to protect the Netherlands against sea level rise. Deltares is also involved in research concerning energy transition and in particular offshore wind energy. Partly funded by governmental agencies and partly by private partners, Deltares’ main objective is to reduce technical and financial risks for offshore wind energy investors. For example, since wave conditions are critical for the installation and maintenance of wind turbines, Deltares runs wave models based on meteorological input to forecast the most suitable timing for operations at sea. Bathymetry models are also run to predict the evolution of the seafloor and its consequences for foundations and cables on the North Sea floor. The Faculty of Aerospace Engineering at Delft University of Technology uses a large spectrum of wind tunnels, suitable for studies in subsonic (< 1 Mach) to hypersonic (> 5 Mach) conditions. The equipment is used to study the aerodynamics of air foils, for aircraft and wind turbine blades, and the aerodynamics of speed skaters and racing cyclists. All experiments aim to reduce the friction on the air foils and, as such, optimise their performance. After some refresher lectures on fluid mechanics, the NVBM delegation had a guided tour of the wind tunnels and gained technical insights on how flow with different Mach values can be achieved. Moreover, the role of aviation in the climate debate was discussed. At the moment aviation is responsible for only 2.5% of the yearly CO2 emissions, but this is increasing at a rate of 5% per annum which poses a challenge. Research into improving the fuels, combustion and aerodynamics of planes aims to reduce the emissions. The research group optimises the balance between crucial aspects of aircraft: performance, aerodynamics stability and control. This does not only involve the shape of the cabin , but also the location of the engines on the aircraft, and adjustments needed for fulfilling safety regulations. Research efforts on the development of (hybrid) electric propulsion was discussed for so-called narrow body aircraft (Airbus A320 size). The day closed with drinks in the bar called “The Atmosphere”.